Here is a cute friendship card made using the Cricut Create A Critter Cartridge. I used Bazzill cardstock and patterned paper from October Afternoon. Clear embossing powder was used for the leaf design. I like the clear embossing powder you used to do the background. Very cute card! 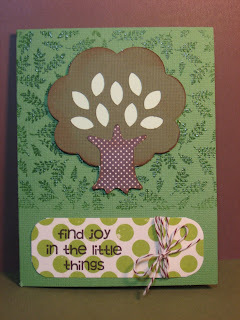 Shirley's posting a card tomorrow using Create A Critter too. You guys! Now I really want that cartridge too! LOL!